Geomagic® Sculpt™ is a simple, fast yet sophisticated precision voxel 3D sculpting and modeling software solution. Create organic designs and edit and transform existing 3D data with sculpting, shaping and detailing tools not found in traditional CAD software. Get the sensation of clay modeling with the benefits of digital design. Fine tune the smallest elements and make products stand out. Sculpt lets you create textures of any complexity in 3D virtual clay. 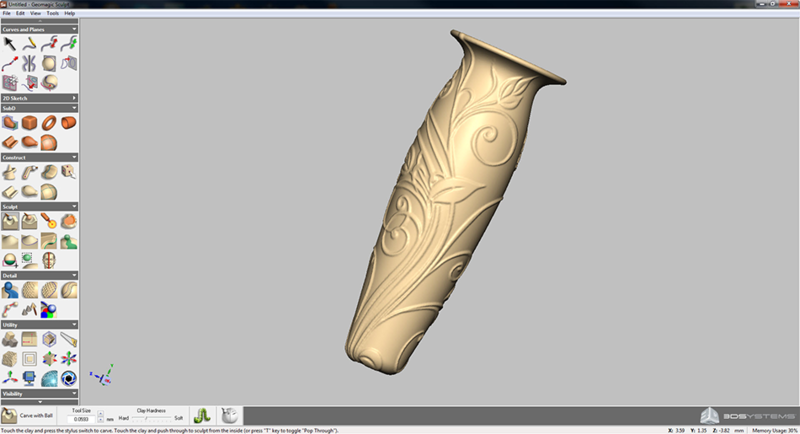 Use embossing tools to create design flourishes, which are often impossible in CAD. Simply import any image and go. The texture you see is the texture you get when 3D printing the model. 3D Systems haptic devices provide true three-dimensional navigation and force feedback integrating a sense of touch into the Geomagic Sculpt 3D modeling systems as well as research and commercial applications. The devices use motors to create forces that push back on the user’s hand to simulate touch and interaction with virtual objects. 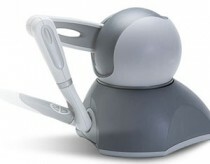 But if you don’t have a haptic device, Geomagic Sculpt will work just as well with a mouse. Create exactly what you want. With Sculpt you can harness the power of virtual clay to easily create exquisitely complex and organic forms. Use real world sculpting concepts in a digital environment with the power of tug, ridge, emboss and deform just like real clay modeling. Sculpt is incredibly intuitive; you can use a traditional mouse or feel your design when you use a Geomagic Touch™ haptic stylus.